Flags and the poles they are installed on are a great way to show off your pride for your country, state or favorite team. Many families have flag poles on their property at their homes or cottages. In addition to flying the Stars and Stripes, families may also choose to fly flags that show off an historic family coat of arms, or perhaps the country they were born in. If your flag pole is tall enough you can fly more than one flag at a time. 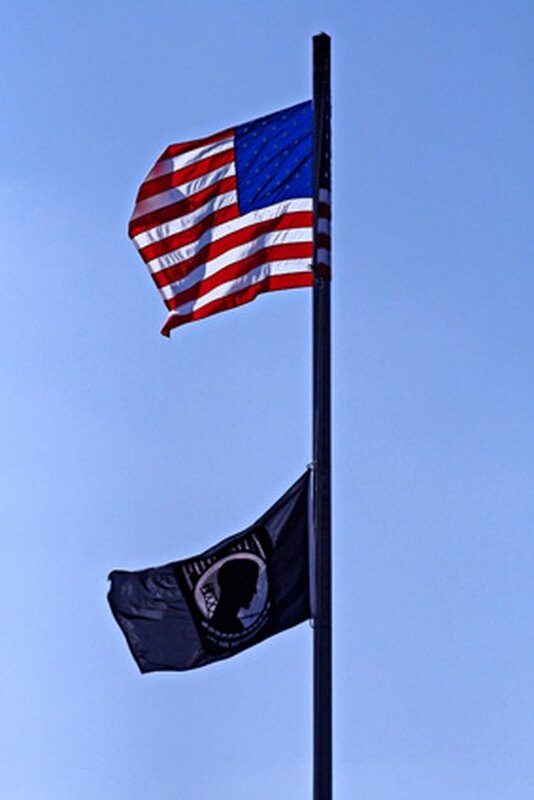 Whenever there are two flags on one pole, the Stars and Stripes must fly highest. Attach the Stars and Stripes on the flagpole rope first, so it flies at the top of the flagpole. It is the policy of all government services that when multiple flags are to be flown, the Stars and Stripes is always at the top of the post. Attach the second flag to the rope just under the Stars and Stripes by pinching together the flag pole's rope to create a small loop and threading the loop through the eye of a snap hook. Slide the locking loop on the hook and pull the rope tight. Connect the top of the second flag to the hook. Repeat step two and connect the bottom grommet to this second snap hook. Raise the two flags by pulling on the rope until the flags reach the top of the flag pole. Once at the top, tie off the flag pole rope to the pole's tying bracket.